This year, we have carried out several collaborations with other iGEMers. 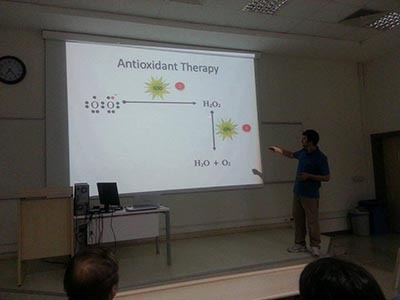 We invited Paris Bettencourt iGEM team to present their grand-prize winning project at the International Medical Student congress organized by our university: Turgut Özal which is known in the media as the ‘most compelling medical congress with the highest number of attendees coming from across the nation and worldwide’. For collaboration matters, we organized and coordinated a SynBio workshop titled as “SynBio 4 All” to engage with the medical students and introduce them to the macrocosm of synthetic biology and iGEM. 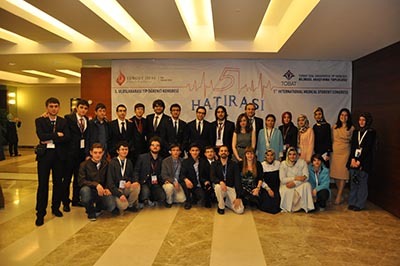 Annually, the medical faculty of our university organizes the largest and the most qualified medical student congress in Turkey with the highest attendance. Last year, over 1,500 medical students and experts attended our congress to present, learn and discuss new researches and treatments in the field of medicine. 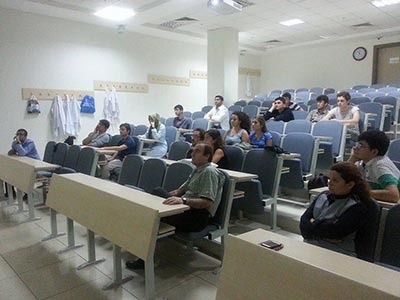 Medical students all over the world and Turkey distinctively join to present their scientific research conducted throughout the year. Another fact is the international nature of this congress where experts and scientists such as Professor. James Yoo, famously known for his creditable work in the field of regenerative medicine attend, enriching the contents and atmosphere of the congress. Each year, our congress has an extreme impact on the media which never fails to take its place in the news and TV channels. The organization, design, coordination and configuration of the scientific program is not only carried out by a few people but in fact with the entire medical students of our university who work as a team with great delicacy, enthusiasm and in the guidance of supervisors to embody the finest congress of our country. Researches and scientific works performed by students compose the main portion of the event. Last year, 115 oral presentation and 75 posters have taken place in our congress. The topics and scientific background of these projects are also the mainstream and promising features which may pose a great role in the future. For instance, “CRISPR/Cas9 system”; its utilities, possible applications, especially on tuberculosis infection, “tissue engineering” and its novel approaches, the-state-of-art method for “treating colon cancer by using synthetic gut flora” are a few studies presented in the previous year’s scientific program. Just by reading these topics, the potential impact and attribution of our congress to the scientific society can be understood further. However, there is still a certain need of support to ease the procedure of converting these studies conducted by students into scientific articles. This is extremely paramount as they can be trained to become the future’s qualified, skillful and experienced scientists and experts. The encouragement to study and undergo such researches will also be a boost if this support is conducted. Another team we collaborated was METU-Turkey. We held a dinner and presentation evening in our faculty where discussions of our project ideas were articulated and enabled us to intensify our collaboration further. We helped METU-Turkey by providing genetic materials and iGEM kit plates from previous years. In return, METU-Turkey kindly helped us to conduct a significant modelling study. Finally, we mentored the AUC Turkey iGEM High School team this year and guided them in every aspect to increase their possibility of achieving their set goals.